Well, is this weird, or what? I mean, why am I talking about a computer program in the midst of all this relaxed coverage on my trek thru the U.S.? It's a longish story. When I first got my job with Joy School, I spent quite a bit of my free time back in my room working on this program. 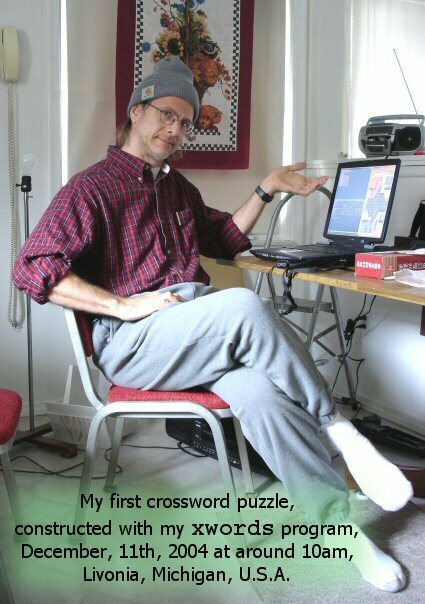 For some inexplicable reason, I was taken with the idea that I might be able to make crossword puzzles and sell them to make bits of spare change. I worked with quite some passion on this thing and had all these high hopes for it. But hopes were dashed when my first attempts to actually make a danged crossword puzzle with it were met with maddening culs-de-sac. Well, I had a notion that I might spend some time on this vacation trying to see if it were possible to salvage the project. 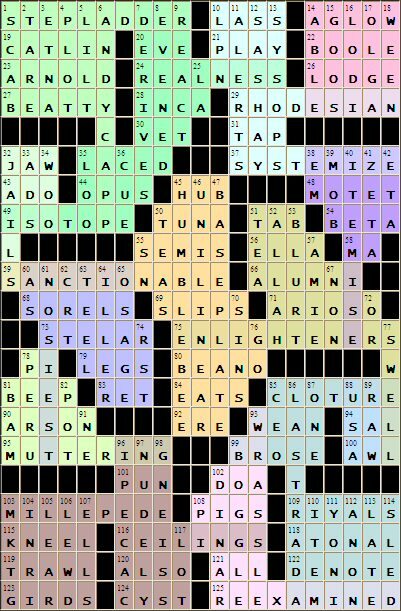 A weird thing happened on the flight to Michigan; I asked a male flight attendant if there'd be any problem with my using an electronic dictionary (actually a Chinese/English translator) during the flight...and he asked me if I made crossword puzzles(!). It seemed sort of spooky to me. I gave him a funny look, and mentioned that I'd only just resolved to revisit this program. 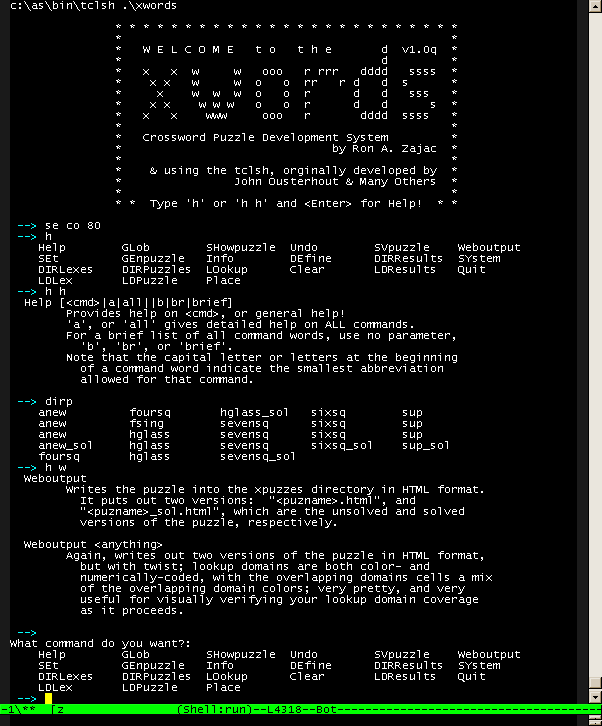 By the way, xwords is written in tcl—John Ousterhout's excellent scripting language. 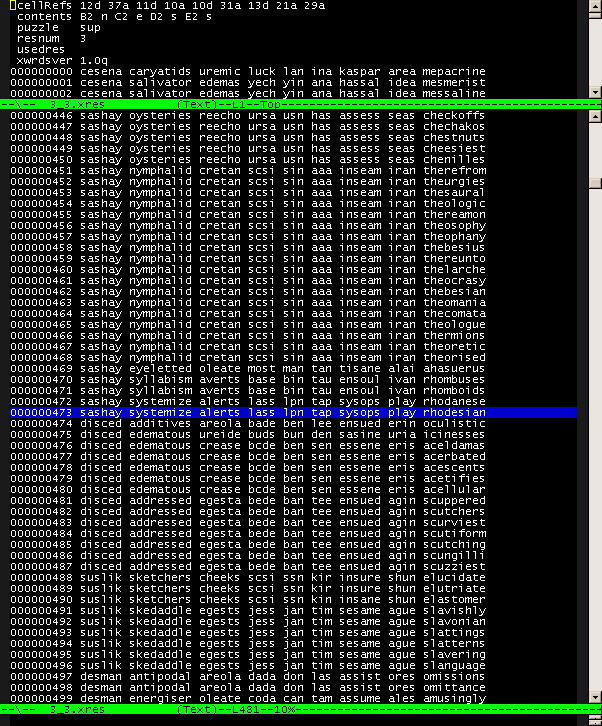 Because xwords is written in this precompiled interpreted language, I had to come up with some interesting optimizations to compensate for its inherent [relative] slowness, such as a system which generates a minimized assocative array serving as a "fast glob" pattern match for any possible word at any point in the domain lookup. Anyway, I got one darned puzzle out of the thing...and me without any champagne!